We encourage you to visit our beautiful lakeside campus here at 1250 Turner Street in Auburn, Maine. Learn more about our campus, and get directions. From the moment you step in the door, the faculty and staff at CMCC will help you achieve your academic and career goals. Our mission is YOUR success! Apply today to get started on a great career and an exciting future. We offer over 40 degrees, certificates, and advanced certificates taught by dedicated faculty. Choose your area of interest, and learn about the excellent programs we offer to help you reach your goals. We offer many ways for students to become more involved on campus. Play a sport, join one of our many organizations, work out in the fitness center, or enjoy our many lounge areas – the choices are many! Join fellow alumni in helping to pave the way for current and future Mustangs. Through your kind donation to the CM Education Foundation, students receive scholarships to help them achieve the dreams. Say “Yes” and donate today. Increase your knowledge and employment opportunities with a wide range of professional development opportunities! Central Maine Community College (CMCC) will host an informational program on Wednesday, July 12 from 4:00-7:00 p.m. for students interested in attending the college this fall. This informal open house will include information on admissions, financial aid, academic programs, and campus tours. All students applying at the event will have the $20.00 application fee waived. Assistance will be provided in completing the admissions application and the Free Application for Federal Student Aid (FAFSA). While an RSVP is not required, anyone interested in attending is encouraged to do so online at www.cmcc.edu. Light refreshments will be served. Please call the Admissions Office at 755-5273 or 800-891-2002 X273. 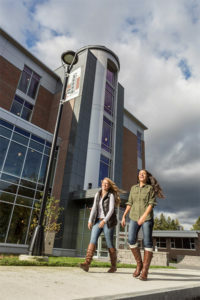 Photo Caption: Students walk past The Tower at Central Maine Community College. The College is hosting an evening open house on Wednesday, July 12, from 4:00 to 7:00 p.m. Copyright 2018 Central Maine Community College.